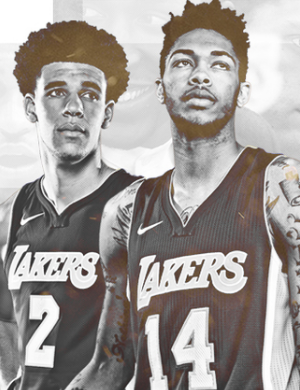 LakersGround.net :: View topic - News 'n Views - July 2016: What’s Brandon Ingram’s Ceiling? News 'n Views - July 2016: What’s Brandon Ingram’s Ceiling? As we reflect on our first look at Brandon Ingram in NBA Summer League action, just what exactly is his professional ceiling with the Los Angeles Lakers? When you look at Los Angeles Lakers forward Brandon Ingram‘s physical gifts and knack for scoring, it’s hard to not initially compare him to superstar forward Kevin Durant. Comparisons for a player generally come from describing him to someone who’s never seen him play or needs a quick “scouting report.” The thing about this particular observation, though, is that Durant agrees. “He reminds me of myself, but he’s a little farther along than I was at that stage,” Durant said after Team USA practice. “I feel like if you continue to keep working, he’s with a great organization that’s going to push him and put him in a good position to be who he is. That’s very high praise for a rookie who hasn’t played in any NBA games outside of Summer League. Durant is an established talent while Ingram is still all potential, though it’s curious to think about what he means when he said Ingram is farther along than he was at this point. Nevertheless, it seems that Ingram will hear Durant’s name alongside his so long as he keeps improving and adding to his game at the next level. But is Durant his ultimate ceiling? Other than that it’s not even close. Durant averaged more points, rebounds, steals and blocks per game while shooting better overall from the floor and the free throw line. Not only that, but Durant was stronger and had a weight advantage that Ingram doesn’t have yet coming out of college. So what did Durant mean when he said what he said? It has to do with Ingram’s feel for the game. While many players and fans alike are enjoying (or dreading) the downtime of the NBA offseason, some of the players are still hard at work. Lakers guard Jordan Clarkson has spent little time during the offseason resting up. Instead, he has constantly been in the gym, trying to improve his game for the 2016-17 season, even after landing a new four-year, $50 million contract. This upcoming season will feature a new head coaching staff, led by Luke Walton. In a Thursday workout at the Lakers’ practice facility, Clarkson made it well-known on his snapchat account that he’s enjoying the new staff in place. Throwing the ceremonial first pitch at Dodger Stadium is a rite of passage for important additions to the Los Angeles Lakers. Many Lakers from the likes of Kobe Bryant to Jordan Clarkson have had the honor of throwing the first pitch for the Los Angeles Dodgers. Walton is not new to the franchise, as he played nine seasons donning the purple and gold, but he was the hottest commodity among head coaching candidates this offseason. The Lakers made a splash when they hired Walton to be the head coach of the future, and he will be formally reintroduced to the Dodgers faithful when he throws the first pitch on Saturday. There is a lot of pressure on those who are chosen to throw the first pitch in baseball games. There are those who throw a perfect strike, and then there is Nick Young, who ended up throwing the ball somewhere between home plate and first base. New York Knicks President Phil Jackson is regarded as the one of the best coaches of all time in any sports. The Zen master racked up 11 championship rings, including five with the Los Angeles Lakers, by employing the triangle offense. The triangle is known for being complex and difficult for some to understand. Recently a couple of teams have tried to employ it, including Jackson’s New York Knicks, but the results have not been great and Jackson believes he knows the reason why. Basketball has certainly evolved since Jackson was a head coach in the NBA. Today’s offense heavily relies on the pick-and-roll, spacing, and drive and kicks with an uptempo pace. The triangle is designed to pick the defense apart in a slower half court set. The Los Angeles Lakers have no shortage of young, talented, athletic players, but none are more explosive than second year man, Larry Nance Jr. Son of a dunk contest champion, Nance Jr inherited one of his dad’s most impressive attributes, the ability to down right jump out of the gym. Coming into last season, fans didn’t know what to expect from the 22 year old forward who played all four years at Wyoming University and was coming off of an ACL tear in February 2014, but he quickly exceeded all expectations. With impressive in game dunks and constant hustle, Jr quickly became a fan favorite, with chants of “Larry! Larry! Larry,” becoming a staple of STAPLES Center last season and this Summer League campaign was no different. Access Sportsnet did the lord’s work, compiling the top five plays for Nance from Summer League and they didn’t disappoint. Though he turned defense into offense with sneaky steals and acrobatic blocks, it should be obvious that Nance’s top plays were his high flying dunks. April 13, 2016 was a bittersweet day for fans of the Los Angeles Lakers when Kobe Bryant played the final game of his legendary career. Kobe went out with a historic 60-point performance, and now we are left with hours of highlights and five banners to remember his career. Though most remember only his exploits while wearing the purple and gold, Kobe had plenty of highlights while rocking the red, white, and blue for Team USA. Brandon Ingram has legitimate potential to be a top 5-10 player in the NBA. Once this kid puts some meat on his bones and becomes more experienced the league is in trouble. Check out our Summer League highlights and analysis that we posted a little while ago on Brandon Ingram.. It's impossible to put a cap on his ceiling right now, which is what makes him one of the best prospects, if not the best prospect, in recent years. And if he's still growing, then you can throw any future projections out the window. For the moment his ceiling appears to be getting a contract to sign lol.